Manny Pacquiao is in full support of Tenhsin Nasukawa’s opponent for RIZIN 15 but he wanted to give some respect to Nasukawa for stepping into boxing to face Floyd Mayweather, Jr. at RIZIN 14. Pacquiao met with RIZIN CEO Nobuyuki Sakakibara in early April looking to expand opportunities for Pilipino fighters in combat sports. The fighter Pacquiao is backing for the event is Fritz Biagtan. In a press release from RIZIN, Sakakibara wanted to clear the air regarding a social media post teasing Pacquiao’s involvement and many thought the famed boxer was looking to jump into the RIZIN ring, which was not the case at all. While Pacquiao was not trying to copy what Nasukawa and Mayweather did for New Year’s Eve, he did want to give praise to the 20-year-old martial artist for stepping in with a boxer as good as Mayweather is under boxing rules. “I respect Tenshin Nasukawa for taking on a challenge against Floyd Mayweather under his rules,” Pacquiao said of Nasukawa. “Tenshin and Myself are the only Asians to have taken such a challenge,” he continued while adding that he plans to be in attendance April 21 to support Biagtan at RIZIN 15. 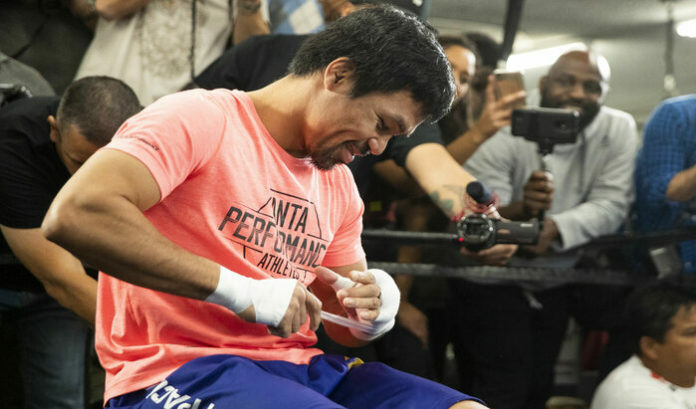 While a match with Gomi and Pacquiao might be interesting, Gomi and RIZIN may have to wait in line since Pacquiao agreed to a match with Errol Spence Jr. before any talks with RIZIN surfaced. Would you want to see Pacquiao in an exhibition match against Gomi?